Our standard cards are offered in 14pt or 16pt stock with choices of uncoated, UV gloss, or matte finishing. TURNAROUND TIME: approximately 8 business days from artwork approval. Ask us about our temporary cards if you need some in a hurry while you wait for your cards. OUR BEST SELLER! You can write on these cards with a pen. 2" X 3.5" or SKINNY 1.5" X 3.5"
You can choose to have the gloss on one side only or both sides. You can not write on this coating with a pen. Uncoated cards are best used for appointment cards. You CAN write on this coating with a pen or pencil. Gloss coating on one side is offered as an option. 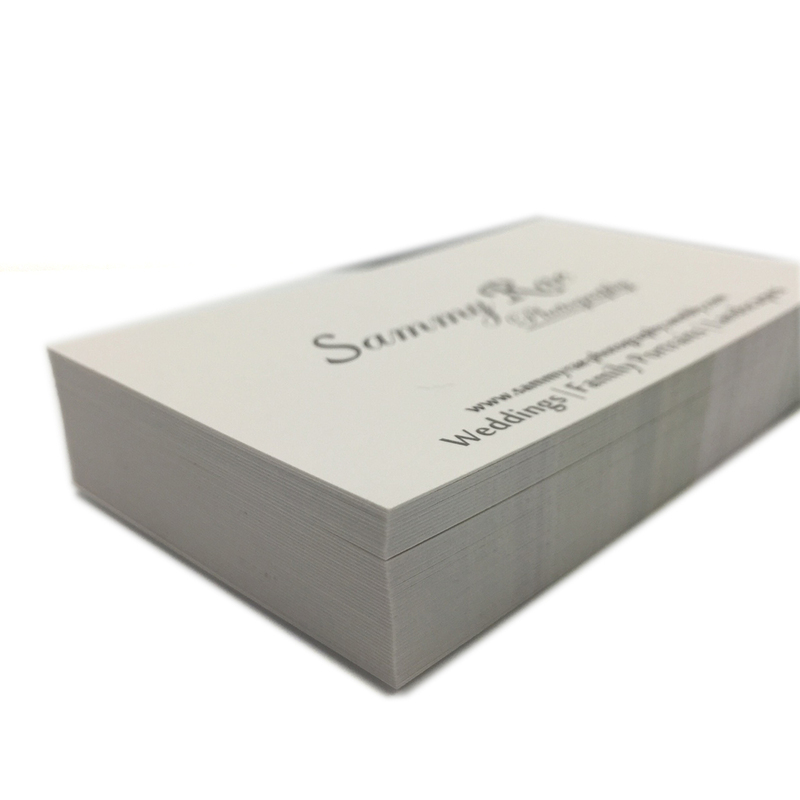 Have your business cards printed on our unique premium stocks! OUR BEST PREMIUM SELLER! 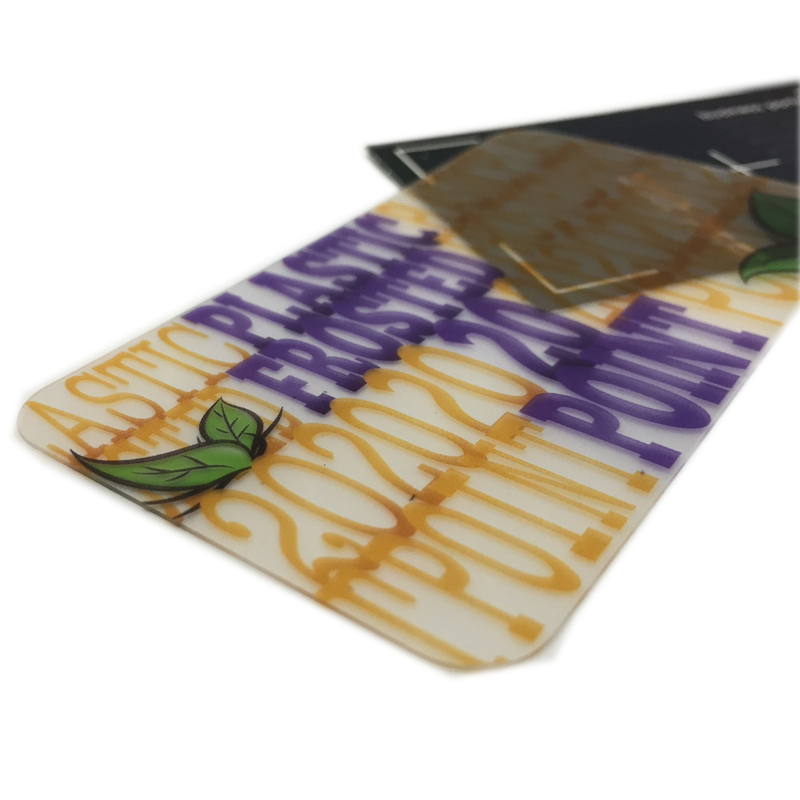 The silk coating is velvety smooth to touch and give the cards a multi-textured look and feel with unique spot UV option. You can write on these cards with a pen. Our linen cards have a cross hatching texture to give your cards a more organic feel. You CAN write on this coating with a pen or pencil. Linen in short run quantities 50 to 100 is printed on ivory stock. Suede cards are coated with a velvety laminate. They are softer to touch than even our silk cards. Our Ultra Thick cards are 32pt stock with a black core and a premium white printed surface. Our plastic cards are printed on 20pt plastic and are offered in three styles, opaque white, frosted, or clear. Corners are automatically rounded and are offered in either 1/4" or 1/8" radius'. Along with our standard business card size plastic cards are also available in "skinny" size, or oval size. Corner radius options are 1/4" or 1/8". • Available in single sided or double sided printing. Semi-transparent cards available in single sided printing only. • Corner radius options are 1/4" or 1/8". Fully transparent cards available in single sided printing only. • Corner radius options are 1/4" or 1/8". Give your clients a business card that will last! Why go straight when you can go round! Excellent for temporary cards. Turnaround time is less then one day. Use for appointment cards. Easy to write on with a pen or pencil. Also available in "skinny" format. Turnaround time from artwork approval is 8 business days. Easy to write on with a pen. Also available in "skinny" format. Standard cards are also available with full UV coated on one side or both sides for the same price. Turnaround time from artwork approval is 8 business days. This is velvety smooth card is our most popular! Also available with spot UV. Turnaround time from artwork approval is 8 business days. Our most popular card with a twist. Spot UV can also be applied to standard matte finish cards. Turnaround time from artwork approval is 8 business days. Make a logo or image on your card really POP with spot UV! This feature is available on one side or both sides as well as on both matte and silk cards. Turnaround time from artwork approval for these cards is 8 business days. Magnets are available in assorted sizes. Business card sizes are available in the standard rectangle shape or in oval! Turnaround time from artwork approval is 8 business days. Our plastic cards are available in an assortment of features such as opaque (seen here), frosted, clear, and 4D Lenticular cards with two or three images! Turnaround time for any of these cards from artwork approval is 14 business days. Our plastic cards are available in an assortment of features such as frosted (seen here), clear, opaque, and 4D Lenticular cards with two or three images! Turnaround time for any of these cards from artwork approval is 14 business days.